Expect to discover a new world! Capoeira is a one of kind art that emcompasesses many discliplines in one- this makes it unique, interesting and inspiring both physically and mentally! 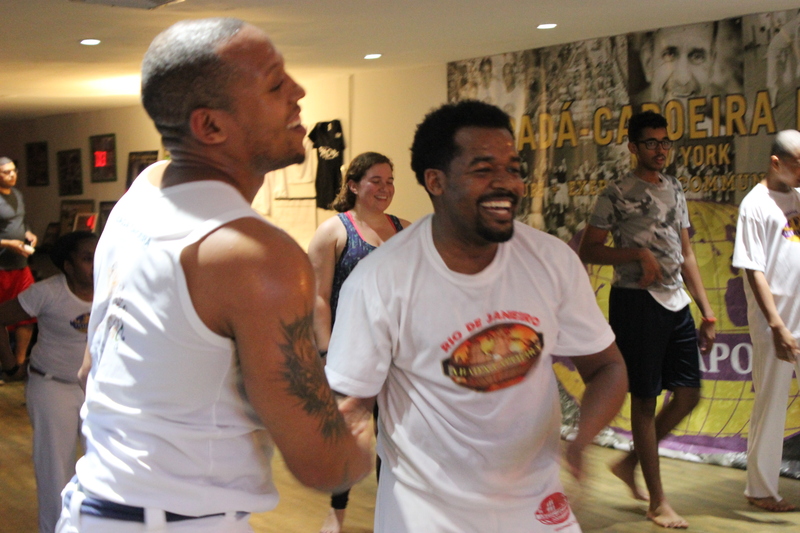 Capoeira is not only one of the most engaging forms of exercise – you will workout muscles you never even knew existed! – it is also a culturally-rich art that will expose you to another language – many students eventually learn to speak Portuguese – music and history, just to name a few. Capoeira is a community-oriented art form where practitioners must work together (vs. against one another). It is common for classmates to bond and long-lasting friendships to be forged. In all of our classes, older students will usually be at the front of the class and serve as guiding examples to follow for newer students. Advanced students will be encouraging and willing to help beginning students as they learn new moves. Anyone can join class anytime. We do recommend for new students to take our BASICS class on Saturdays at 10am to begin building a foundation of the fundamental movements of capoeira. You can take our BASICS class simultaneously while attending on-going capoeira classes during the week. Click here to see a Capoeira glossary – see names for basic moves and terms inc capoeira and names/information on the instruments used in capoeira. You can also read our FAQs.